You just need to enter and share your recipe ,show off your talent and win a fabulous prize from Ainycooks. I am honored and thankful to Chef Ashok Kumar Raj, a top Chef from India, who has selected 3 top recipes. Contest was about our Pakistani Traditional food with modern twist , a lot of entries we have received but it was a labor of love for our Judge to sort through such impressive recipes. Congratulations to all the finalists and winners of the contest, This time entries were impressive and innovative, and the judge had his work cut out for them. PAKISTANI FLAG CAKE by Laila Asim took our top spot, with its glorious presentation and awesome concept with compelling pic. She Won this fabulous prize. 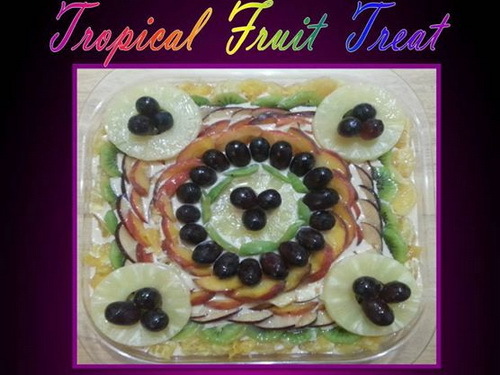 TROPICAL FRUIT TREAT submitted by a new comer Tehmina Asif , the concept and execution were impressive. Took second place. 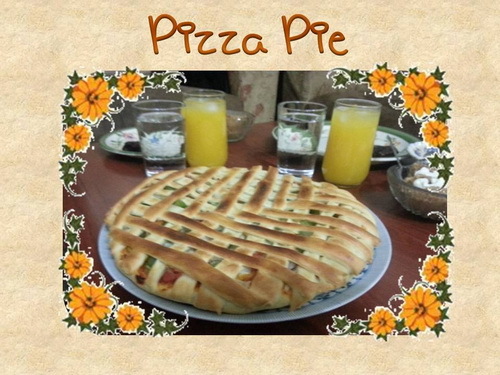 PIZZA PIE by Maliha took third place, impressed everybody and So much care and detail was put into creating such a gory, and yet appetizing snack. 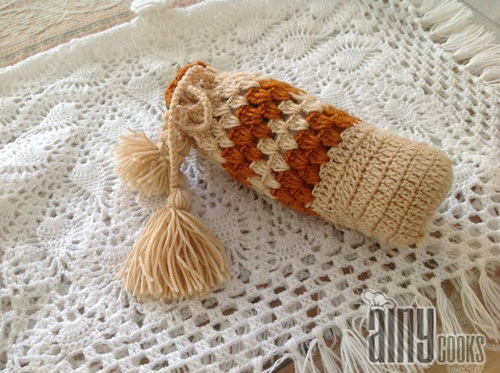 A famous chef Zarnak Sidhwa from Pakistan was a judge of this contest and two winners selected by her.The giveaway was beautifully designed Crochet Bottle cover and Tray cover. 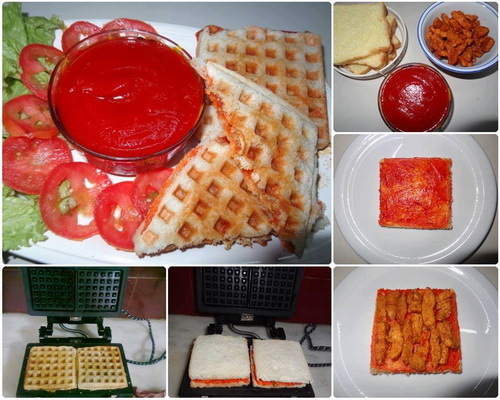 Second winner was Rubina Chudhary ,whose interesting recipe of Chicken Tikka Waffals were her own creation. On first blogoversay I arranged a contest, which was Best caption on a picture. And the winner of this contest was Saniya Shehzad ,who won a book on Baking. Friends, Knorr and Ainycooks arranged a contest for you and your family. Summer is in full swing and Eid is after few days. Keeping this in my mind I have decided to invite you all to share easy and quick recipes for last days of IFTAR and upcoming Eid feasts. Write ingredients with correct measurements. Send an original picture with recipe , no web grabbed pic. Picture should be clear. Mention your name clearly with recipe. 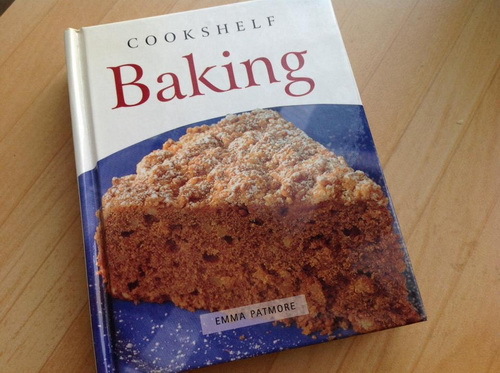 I will judge your recipe on overall recipe method and presentation. Participant can be of any age group because its a family contest. The deadline of submission of your recipe is 3rd July 2016. Only one recipe is acceptable. The winner will be announced on Monday 4th July 2016. 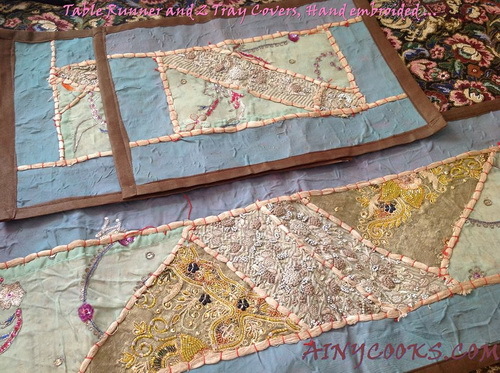 Winner Recipes will be featured on my website AINYCOOKS. 2 winners will get GIFT HAMPERS from KNORR. 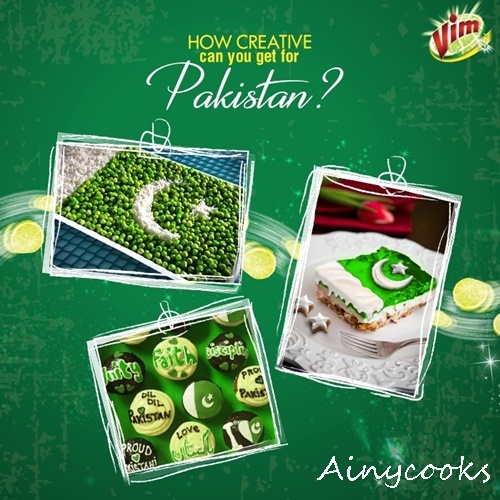 Celebrate Independence Day and your love for food in a creative way by preparing a patriotic dish with Green and White ingredients! Take a picture of your creation, share the recipe and write a few lines on the spirit of Independence. Winners will get Gift hampers from Vim because all this food experimentation leaves a pile of greasy dishes, right? For me, these worries are taken away by Vim Gel. Now I get squeaky clean dishes within no time! 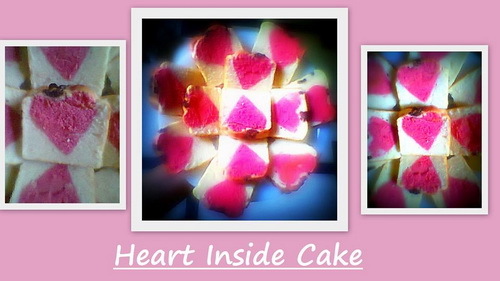 Submit your recipe on Ainycooks facebook Page ( INBOX me ) or email me at quratulainnoor@hotmail.com. Prepare recipe with Green and White ingredients. All recipes must be original, product of one’s own mind and not a copy or imitation. Entries must be received by 12 August till midnight on August 19, 2016. Winners will be notified by August 23, 2016. Recipes will be judged on taste, originality, ease of preparation and appearance. Winning recipes can come from any category. Judges will disqualify recipes which to their knowledge are previously published recipes. Judges’ decisions are final.